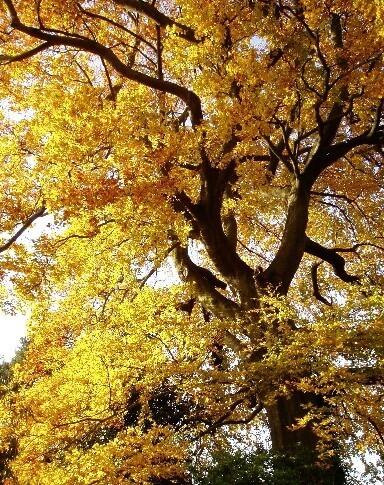 We are now well and truly in the leaf gathering season so ensure that you make the most of nature’s bounty by rotting deciduous leaves into leaf mould for use as a fantastic soil conditioner. Leaves need plenty of air circulation to decompose and must be fairly wet when stacked to kick off the process. I have never found watering a stack of crisp brown leaves to be as good as collecting them wet from rain or dew. The traditional method is to make a cage from chicken wire supported by 4 stout stakes and the modern alternative is to fill black plastic sacks and puncture them with a garden fork. But now loosely woven Jute Sacks are marketed for the purpose so you are not left with a useless plastic sack to go to landfill once the leaf mould has been tipped out. You simply collect leaves direct into the sack and leave the whole thing to rot down together. Sack and contents realistically take two years to become usable leaf mould. We filled a few of these jute sacks last year in the GbD garden and they are now well on the way to decomposition. The only downside I can see is that your ‘container’ disappears so you need to site it in a place that can cope with a loose heap of well-rotted organic matter at the end of the process.